The authors became friends for three years in the international artistic project “Artist’s Revolution”, organized by the c.a. 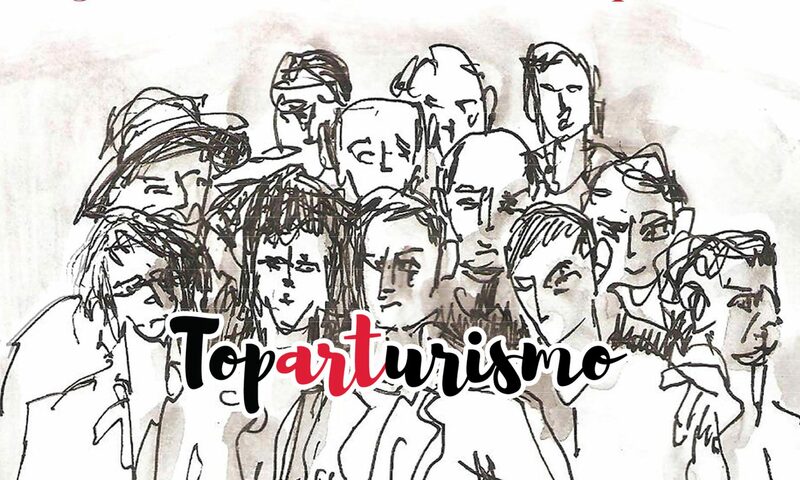 “Toparturismo” which carries plein airs, exhibitions, artistic – creative camps and trips. The project takes place in France, Italy, Germany and Lithuania. These exhibitions for Lithuania viewer would like to introduce Valdemaras Šemeška and Alina Daiker Gulbinienė classical, Alessandro Rillo conceptual paintings. This inter-generational and stylistic authors whose works are exhibited together in exhibition space, creates a very interesting atmosphere. Realistic painting of V. Šemeška presents a condensed colorful still lifes, landscapes and various figural compositions. The author analyzes the topic often turns into cycles, forcing the viewer to look at the subject more and more deeply, “inspect” it from all walks of life points and positions, both endearing natural beauty and bringing social problems. Paints is made in the classic manner of forcing admire and paint stroke texture, color accuracy, professionalism. A.Daiker Gulbinienė is playing with realism and pop art style in her paintings. We can feel playful and comfortable balance finding the most beautiful lanscape of Lithuania, portraits, figure compositions. The author also does not shy away and abstract interpretations of color – technical searches when moving from soft watercolor painting almost by rough, coarse mastichino strokes. Rillo in his works in the begining uses collage technique, looking for discarded, forgotten, none of unnecessary items and use them as a means to convey their produce pure thought. Painting is left in his works only like the older sister with format and used color as a basis for their work. Metal, wood, leather, plastic applied destination devoured items in Rillo conceptual paintings often obtains very unexpected new image and meaning. As V. Šemeška works of Rillo evolves into cycles. Contrasting works of art exhibited at the same time, creates between the artists, a kind of an interesting discussion. Purified, abstract, colour- rem form “sets the tone” for realistic, colorful, glassy and very rich classical painting, which unfolds like a more contrasting background. In this expression, forms and techniques antitesi is a big common denominator or otherwise – contrast unity. These authors address the existential, social and domestic problems, or, in other words, the paintings “novel” theme – the same, very expressive and full of inner strength. 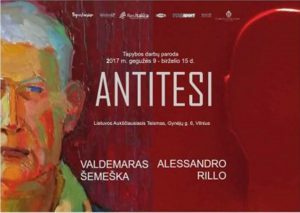 Šemeška and A. Rillo works are well known for art connoisseur, they are actively creating and their works are regularly shown in various group and solo exhibitions in the whole Europe, a lot of works is in the private collections. 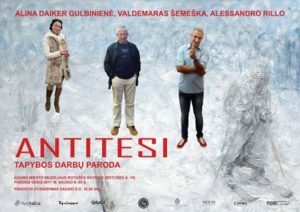 A. Daiker Gulbinienė is just starting her works show. Successful, intensive alongside her teachers, she actively participats in artistic activities and step by step creats her audience base. All Antitesi project exhibitions attracted a lot of interest from the press and the audience.